Tales from the Den of Chaos: First fruits! Wait...beets aren't fruits...well, never mind! 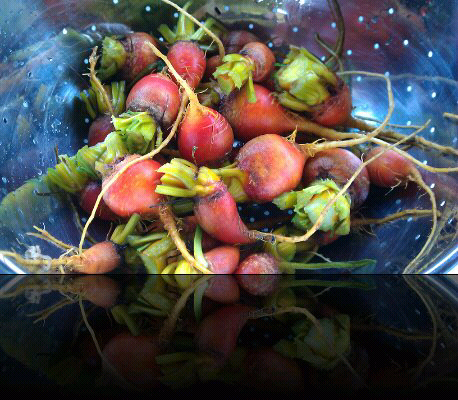 These are golden beets, from one of the front boxes! The seeds over-wintered in there, and came up like gangbusters not long ago. Unfortunately, I spaced on taking the anti-cats wire off, hence the too-early harvest. But they'll still be sweet and lovely, maybe baked in a little balsalmic vinegar in a slow-ish oven. Hi, Spring. Glad you're back. The colours in that picture are fabulous. You dye, correct? You should try to dye some yarn those colours. I don't dye. But I am dying to try some day, hahaha!! Ooh, yum! Do you eat the greens, too? We always did when I was a kid, but I've never had golden beet greens. its funny, I just ready Soulemama's blog and she's just seeding gold beets as the snow flies around her (in Maine). Me, I'm stuck in the middle (Chicago)and running way late trying to seed for my first deck garden.